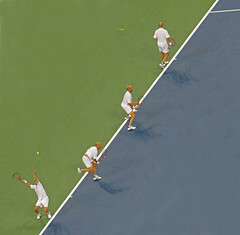 Here’s a cool montage of Andre Agassi by flickr user Amazin’ Jane. This is from his last career victory. The scene today at the end of his last match was one of those rare televised sports moments where you witness something very special. Agassi was down two sets to one but it was looking like he would take the fourth set to push the match to a fifth set. But out of nowhere, Benjamin Becker turned it around and took the match. Just like that, Agassi’s career was over. The U.S. Open crowd gave Agassi what seemed like a 5 minute standing ovation. The announcers said very little while the crowd continued to applaud, including Becker. After a respectful speech by Becker, Agassi gave a very gracious speech to the crowd, thanking them for their support over the years. A very class act. The scoreboard said I lost today, but what the scoreboard doesn’t say is what it is I have found. And over the last 21 years, I have found loyalty. You have pulled for me on the court and also in life. I’ve found inspiration. You have willed me to succeed sometimes even in my lowest moments. And I’ve found generosity. You have given me your shoulders to stand on to reach for my dreams, dreams I could have never reached without you.